Your understanding and experience can impact the way you collect, analyze and report on data. Incomplete data, misinterpreted results, or simply reporting on the same metrics over and over again can hide the real drivers of your business. Recommended related visualizations help guide you to further exploration, and system-generated insights uncover trends you may not have thought to look for. This reduces the opportunity for bias to influence your results and uncovers valid sources of success for your business. Access data from all your sources in one place. Combine your data with additional resources, like weather and geospatial data, so you can have a comprehensive view of your business. Quickly and easily share your insights with detailed reports and dashboards to drive timely decision-making for greater impact. Become the data guru on your team with IBM Cognos® Analytics. Leverage the AI Assistant to ask deep data questions using natural language with no programming skills required. Discover connections hiding in your data and create unbiased reports to enable your organization to make better decisions, faster. Cognos Analytics – scale insights on demand with AI everywhere. 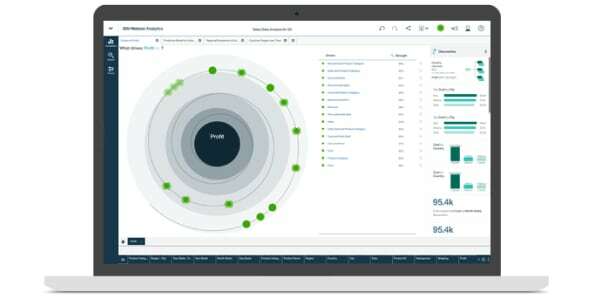 The all-new exploration capabilities in IBM Cognos Analytics allow you to use natural language to uncover insights you might not even know to look for. With IBM Cognos Analytics, it’s easy to share your insights with detailed reports customized to reflect the look and feel of your business. Once you have the perfect look, save your formats and styles for later use. Find out why the analysts at BARC gave IBM Cognos Analytics high marks in a variety of focus areas that matter to you and your business. This short video showcases the highlights of the all-new IBM Cognos Analytics. This retail and commercial real estate company discovers AI-guided data exploration and suggested visualizations and insights in natural language. To manage its pipeline of IT projects, Genpact turned to IBM Cognos Analytics to break down silos and tap into rich cross-functional insights. This global real estate portfolio turned to IBM Cognos Analytics to lay the foundation for rapid asset growth with deep insights.